When it comes to plumbing, there are certain 'cold weather' preventative measures that will help maintain a healthy, efficient water system and avoid excess water loss and excessive bills. In addition to the harsh winter weather, the holiday season adds extra stress to your plumbing system due to increased activity from guests. In fact, the day after Thanksgiving is the busiest day of the year for plumbers. Thankfully, you can prevent many common plumbing problems by being proactive and following Direct Energy’s maintenance tips to help safeguard your system throughout the winter months. When the temperature drops below freezing, water pipes in your home have the potential to rupture, creating an expensive disaster in your home's basement. The average homeowner's expense for a pipe rupture is about $15,000, according to State Farm Insurance. 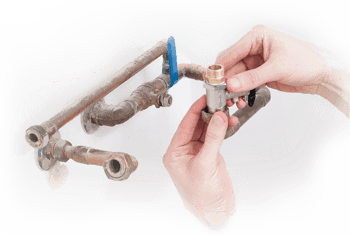 To protect against frozen pipes, turn off all outside water valves and then look for pipes in un-insulated areas of the home, such as those running along the home's outer walls. These pipes are the most likely to freeze and should be wrapped with foam or towels for the season. In cases of extreme cold, it's a good idea to let faucets drip slowly in order to encourage water flow. If at any time during the winter you’ll be away from your home, you may be tempted to turn down the heat to save energy. However, turning the heat too low increases the risk of frozen and ruptured pipes. The damage caused by such an accident will be even greater if the rupture goes unnoticed for days, weeks, or even months. To best prevent a pipe rupture, the home's temperature should be set no lower than 45F. This solution offers maximum savings while protecting against frozen pipes. Conserving energy during the winter months while staying cozy indoors can be tricky, but we have thermostat recommendations for when you’re home to make sure you stay comfortable and avoid high bills! Your water heater is more important now than any other time of the year, so this is the perfect time to make sure it is running optimally. A professional plumber can service the unit by checking the tank's sacrificial anode rod and making any repairs or replacements necessary due to wear or corrosion. When it comes time to adjust the heater's water temperature, don't set the dial above 125 degrees F. This will prevent scalding water as well as reduce energy waste. The holidays inspire some of the largest meals you'll prepare during the year, so how you dispose of cooking-related messes, leftovers, and table scraps can significantly impact your plumbing system. For example, fats or oils accumulate while preparing many meals, but these leftovers should NEVER be poured down your drain as they can congeal and clog pipes. Instead, allow grease to congeal in the cooking dish and then scrape it into the trash. In terms of your garbage disposal, it is best to turn it on first and then add the food debris. After the machine has done its work, shut it off and run plenty of water down the drain to clear the system for the next time you need it. Winterizing your lawn can help improve drainage from snow and rain. Removing debris from your yard to ensure your gutters and downspouts are clear before the winter will improve their ability to drain runoff. Hire a technician from a well-known, reputable organization such as Direct Energy. Make sure the technician is licensed and insured. Use a technician who will provide an upfront explanation of the entire repair process. Ensure you have an itemized work order that shows exactly what is going to be done and how much it will cost - in advance!